Unless you’ve been living under a rock for the last couple of years, you’ll know the importance of social media, and most importantly, the importance of using social media as a marketing tool. Social media marketing is a tough nut to crack, but with constant small improvements and consistent work, you can master it- sooner than you might think. If you’ve got started with your social media marketing, always looking to improve is the recipe for success. But what small changes can you make to your strategy that will make huge differences in how your campaigns perform? In this article, we’ll present you with 5 small yet effective changes you can make to your overall social media efforts that will lead to huge improvements. This is 5 Simple Ways to Boost Your Social Media Marketing. This is a common mistake that I see brands commit. Unfortunately too often. However doing this right can dramatically increase your overall presence on social media. Your bio is one of the first things people will notice when visiting your page. Make it appealing and worthwhile reading! If you are let’s say a clothing company, it should be instantly recognizable what brand you are and what you’re selling when visiting your page and reading your social media bio. Related: What should my social media bio include? Unfortunately, too many brands out there aren’t putting a lot of effort into this. Fortunately though, since you’re reading this, you won’t be one of them. Read through the points and see if you have included all of them on your social media pages. 1. Make it easy to understand what your brand is all about. Kind of a no-brainer, yet so easy to miss. Describe your business in one or two sentences and make it easy to read and understand. 2. Add your business name in the top of your bio as this will help increase brand-awareness. Adding your link in your bio lets people know your page is the real deal. 3. Make your bio fun (if your industry allows it). Making your bio fun by writing a joke etc. can make your page a lot more appealing to people visiting it. After all, the first impression is always the most important. Just like your bio, your profile image will be one of the first things a visitor will notice when visiting your page. Having a poorly sized profile picture can harm your page and make it look like you don’t know what you’re doing – sizing it correctly, however, will do the opposite. This one is a quick fix, yet doing it will improve the first impression people will have when seeing your page. Learning from past social media efforts is a great way to improve future campaigns. And it’s amazing how much you can learn by simply looking at your data. Most social media platforms offer some sort of analytics tool but if they don’t you can always use other services such as Buffer and Hootsuite. You will be posting anyways, so why not post at times when most of your followers are online? 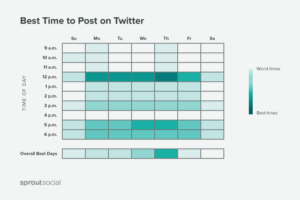 Different platforms have different “ultimate times” of sharing when your post will receive the highest engagement and reach, so it’s important that you aware of these and are posting accordingly. The ultimate times to post isn’t set in rock however they can be a starting point for you. The best time will also be dependent on your follower base and where your followers are from. The times you’ll find below are only times when it is “generally” best to post. 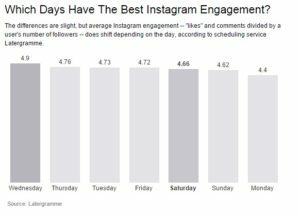 Latergramme also did a test to see what times were best to post on Instagram based on day of the week. 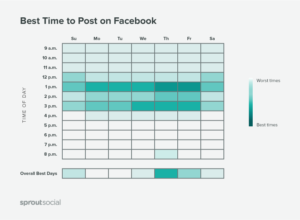 There are also other factors that play a part in when the best time to post is for you. For example, if all your followers are from Europe, they might be awake at completely different times than american followers are, and that’s why it’s important to know your followers. Once again, here, analytics play an important role as you’ll be able to see where your followers are from. 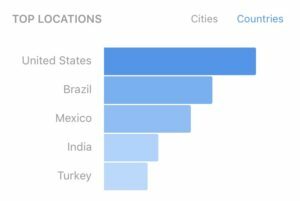 As you can see here, most of our followers are from United States, so having that in mind when choosing the times we post is critical for an improved engagement and reach. Our recommendation is that you are using the times above as a starting point and then experiement your way to the most suitable times for you. It’s easy to get caught up in your social media posting and only post content that you believe your followers will enjoy. This is not a good strategy long-term. Instead of sharing content based on your own intuition, it can be good to ask your followers what they want to see. After all, it is for them your content is meant for. A great way to ask for customer feedback on social media is by running a poll. The great thing with polls is that they are easy to set up, easy to answer, and best of all – give quick results. Here’s a poll Twitter support made on Twitter. 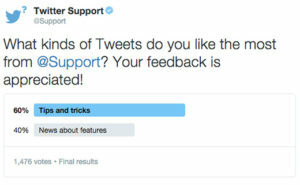 Based on the results from this poll, Twitter support will probably start posting more tips and tricks. Partnering with social media influencers will help you gain a ton of exposure and reach your target audience in a very effective way. Working with influencers might seem like a difficult task but it’s actually not! One of the biggest challenges marketers face when launching an influencer marketing campaign is finding suitable influencers, but with the Veloce Network Influencer directory, the trouble of finding influencers is an issue of the past. The Veloce Network lets you search for influencers with the help of several different criteria. This is so you can be sure to find the most suitable influencers for you, and ultimately let you run a laser targeted marketing campaign with a high ROI. In just seconds, you’ll be presented with a list of the best influencers based on the criteria you have chosen. When running an influencer marketing campaign, the influencer normally takes care of everything – from content creating to sharing and engaging. All you have to do is find the influencer and analyze the results. The best of all is that it generates tremendous results. As a fact of the matter, Influencer marketing content delivers 11X higher ROI than traditional forms of digital marketing. (TapInfluence study with Nielsen Catalina Solutions, 2016) so there’s no reason why you shouldn’t use it to instantly boost your social media results. There are plenty of small changes and improvements you can make with your social media strategy that can make huge differences in your success. This of course, is only the tip of the iceberg, so I have personally hand-picked some articles where you can readmore about improving your social media marketing results. We would love to hear your own thoughts on improving your social media marketing! Do you have any tricks to improve the results of your social media efforts? Let us know in the comments below and don’t forget to share this article with your friends if oyu found it helpful!